EVP Challenger, Gray & Christmas, Inc.
First change your work environment because of the flu; then review the benefits of change…and the better work environment it may have created. It’s Bad Out There: By all reports, this year’s flu season is far from over. It’s twice as deadly as last year and the CDC has suggested it may have 2-3 more weeks of momentum. Think about what this means for a moment. Corporate America has been chasing the ideal balance of productivity for decades. We continue to add technology and reduce headcount. The “holy grail” of productivity has unintended consequences. We Don’t Have Any Bench: If fewer people are doing more work, the loss of anyone is amplified in magnitude. Not only do you lose their productivity but the critical work must still be done, which means those still working must do more. I’m no doctor but I think working longer hours increases your susceptibility to illness. Sharing is Daring: More and more companies are embracing “holocracies”, collaborative groups and think tanks. The private office is also fading away. The common space for meetings and presentations is often the crown jewel of companies as they utilize technology, teleconferencing, webinars and digital “town meetings”. The problem is: we are unintentionally creating hotbeds of contagion. Health clubs encourage everyone to wipe down the treadmill before and after using it. I’ve yet to see the same antibacterial wipe dispenser in a conference room. It’s almost impossible to wipe down remotes and phone key pads. What about wiring connectors and light switches for these spaces? Do What I Say…Not What I Do: How did getting a flu shot become a sign of weakness? Reports indicate that this year’s vaccine is only 17% effective in preventing the flu, it is still effective in reducing its severity. It’s like the anti-vaxxer movement went subconscious. If you say: “I didn’t get a flu shot, because the last time I got one, I got sick.” You might as well say: “I don’t wear a seat belt because the last time I did, I got into a car accident”. Management needs to DEMONSTRATE and REWARD smart behavior. They must make their policies known and prove them by doing what they ask of others. People who have sick family members should be supported and encouraged to stay home. Companies need to incentivize this behavior not tolerate it. 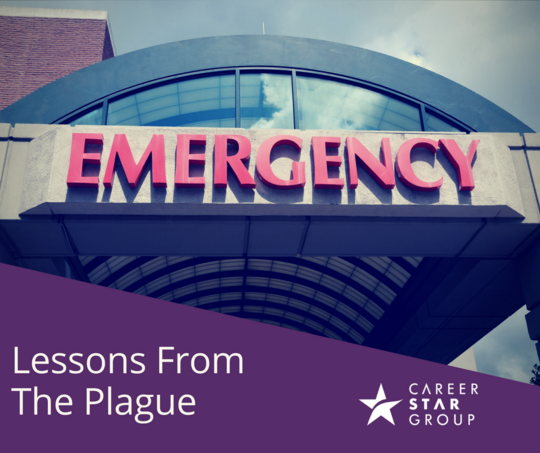 After the Fall: Here’s the new idea that we must embrace – Due to this unusually long and widespread flu season, your company will likely make some significant changes to work; whether it’s working from home; flexible hours; travel bans and restrictions, etc. Before you go back to the way things “used to be” before the Flu of 2018, take time to analyze the changes and see if there were any unintended benefits. Who worked better from home? How much did travel costs go down against the revenue production? Who did amazing work because they were asked, even though it is not what they were trained or scheduled to do? Do we have novel information about succession planning or work-life balance we can fold into the new normal? Did we change the way we do work in a way that reduces negatives or costs without affecting our results? We’ve Always Done it This Way: Companies need to look at what they were able to do through the changes, and determine what might be kept. Penicillin was an accidental discovery but it turned out to be quite useful. Where is the “Penicillin” in changes your company was forced to make?